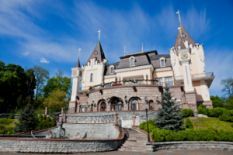 When a traveler has already visited all famous touristic sights of Ukrainian capital, he/she will probably feel desire to explore less-known or even secret spots of charming Kyiv. Experienced travelers say that it is the best way to feel soul and specific character of the city. Trust us - Kyiv has numerous locations to surprise and captivate you. Let`s take a look at some of them. Kioto park is one of the most beautiful and unique parks in Kyiv. It was established in 1972 as a symbol of friendly relationship between Ukrainian capital and Japanese city Kioto. The park is situated on the left bank of Dnipro River between Chernihivska and Lisova subway stations. Fascinating sakura alley of Kioto park, which is almost 1 km in length, is mentioned in Record Book of Ukraine. In June 2017, Kioto park was opened after renovation, presenting updated infrastructure and new amazing Japanese garden of stones. The project of this garden was developed by Japanese designer Shiro Nakane. It includes dry lake, masonry bridge, special illumination and ornamental Japanese plants, adapted for Ukrainian climate. Bronze monument to the nose of famous writer Nikolay Gogol is inspired by similarly named Gogol`s novel (“Nose”), but people tend to think of it like of a copy of real part of Gogol`s face. In July 2006, this funny art object was installed in the front of Andryiivska church on 34, Andryiivsky Descent near entrance to “Triptych” art gallery. In 2011, it was re-located to the facade of building on 13, Desyatynna street. The nose monument was created and presented to Kyiv by well-known Lviv sculptor Oleg Dergachev. There is a funny city legend telling that anyone can heal running nose by rubbing his/her nose against the monument. Zamkova mountain (“Castle mountain”) is one of the most famous mystic places of Ukraine. It is located in the very center of Kyiv, but tourists usually don`t know about this spot. 80-meter high hill received its modern name in XVI century, when Lithuanian prince built a wooden castle on its top. The castle existed from the end of XIV till the end of XVII century. Nowadays, Zamkova mountain looks abandoned. There is no infrastructure – if someone goes up the hill, he/she will find only shady trees and dense greenery, hiding remains of an old cemetery and an empty tomb. However, those who enjoy spectacular views will surely love wonderful panorama of Podil, Andryiivsky Descent, Andryiivska church and Vozdvizhenka, seen from Zamkova mountain. The top of mountain can be reached by stairs from Andryiivsky Descent. Arabic house was built in the heart of Kyiv in 1912 by Ukrainian architect Pavel Aleshin. The house served as a family residence for well-known court counselor Nikolay Kovalevsky. The house is notable for Romanesque architecture style, which is not typical for Kyiv architecture of the end of ХІХ – beginning of ХХ century. The architect has found a unique solution: he designed semicircular building with a dome, hid oblique angles and united two facades of the house. Water-pipes are hidden in the building`s walls in order to keep the beauty and wholeness of facades. Some time ago, Ministry of Foreign Affairs of Ukraine was located in Arabic house. Nowadays, the building is used by Presidential Administration of Ukraine. Kyiv Polytechnic Institute (full name – Igor Sikorsky Kyiv Polytechnic Institute) was established in 1898. It can not be called a completely secret place, but foreigners do not visit Institute often, unless they study here. However, the territory of Polytechnic Institute, which embraces over 120 hectares, is definitely worth attention. The buildings of Institute campus are notable for sophisticated architectural solutions. Some of them are even assigned a status of architectural monument. Large beautiful park with shady green trees and funny squirrels is one of the best spots for photo sessions in the whole city. On Institute territory, you will find interesting exhibited objects, for example, old Soviet steam train, located near State Polytechnic Museum, helicopter Mi-2, plane YAK-40 and tank T-34-85. There is also funny sculpture “Levels of knowledge” and monuments to famous people, for example, to Dmitry Mendeleyev. Visiting Kyiv secret places is the right way to get new bright impressions.